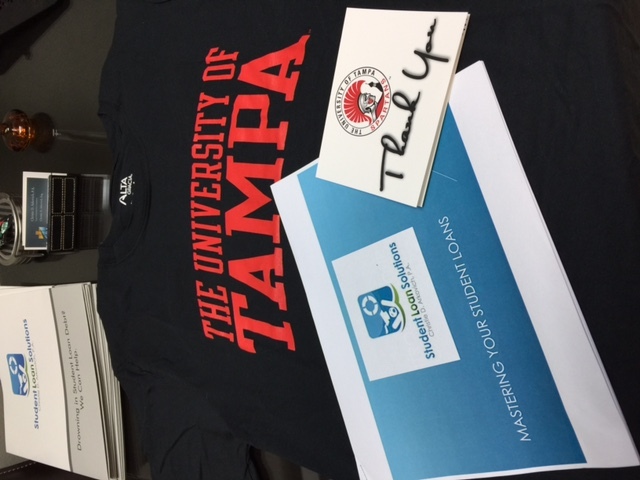 Last week we were invited to speak to students at the University of Tampa regarding their student loans and what to expect. We presented a Powerpoint on Mastering Your Student Loans and held a small workshop for students afterwards. Fox News Channel 13 was there covering the event as well. I think it is great that college campuses are trying to raise awareness in this area. It really is in their students’ best interest to stay on top of their loans. I think my feelings are fairly well known by now, the loans servicers do not represent the student borrowers. They are debt collectors pure and simple. They do not owe a fiduciary duty to evaluate and explain all things student loan related to the borrower. While a borrower may believe they are the “customer”, in reality, the client is the Department of Education or whoever owns the debt. So I’d like to say “Thank you” for this move by more reputable schools taking the reins and bringing in sources of information to help their students with the next step in their lives. If anyone would like to have us present a similar educational program to their group, please reach out to me. There is no charge. I’m happy to send a copy of our Powerpoint upon request as well. For more information about how to deal with student loans, please check out our Student Loan Survival Center at Christie D. Arkovich, P.A.